I like to make fun of Jeff for slowly but surely turning into the human equivalent of a camera store. Since he started working for MU Athletics as a photographer, he’s purchased one piece of equipment after another, and it’s always a guessing game as to what he’ll think to buy next. A few weeks ago, Jeff purchased safety cables with which to secure remote cameras. I’ve never actually seen him use the cables. 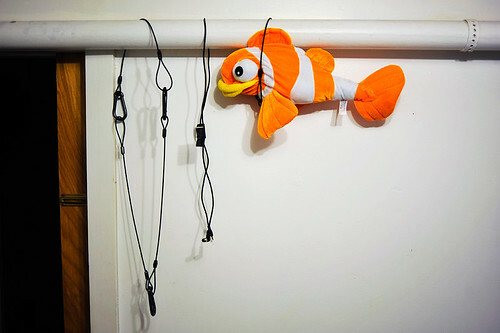 For all I know, they’re used to unnecessarily torture a stuffed fish abandoned by his old roommate Dann. Some of the decor in Jeff's room. In other news — the data recovery company was able to recover all but a few JPG files on my dead portable hard drive. I received the recovered data on Friday after my shift at The Columbia Missourian. So, besides shoot the Kansas State game, all I’ve done this weekend are back up all my files to my desktop external drive; match and confirm the duplicate copies between my portable, desktop and laptop drives; and reconcile all copies to ensure that no data was lost when I eventually formatted the new portable hard drive. It also means that I have all my working project folders and this semester’s photos back. So I can finally blog Days 11 and 12, which I missed because those photos were on the drive, as well as resume work on various other projects. MANHATTAN, Kan. — I’m in the Bramlage Coliseum media room after the Missouri Tigers lost 63-53 to the Kansas State Wildcats. Kansas State senior forward Luis Colon shoots against Missouri sophomore center Steve Moore during the first half at Kansas State on Saturday, Feb. 27, 2010. Two points of interest. 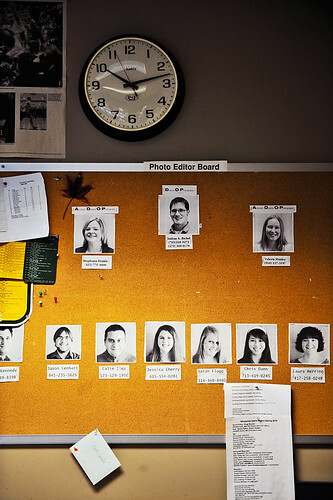 The first: It’s unusual for a Columbia Missourian photo editor to cover a basketball game, but none of the staff photographers could or would volunteer to travel with the writers to Manhattan. The second: I shouldn’t have worn a purple top for a game at/against Kansas State. During the final 30 seconds of the game — which lasted about five minutes of real time — I was bored at my place at the endline. One of my camera batteries had died, so I was switching between lenses on the other camera, and I was pretty dissatisfied with my situation in general. So I went into the stands, where I saw a young boy whose emotions were very much invested in the game: He was crying, shouting and, at some points, turning away from the court as if he didn’t want to watch the Tigers lose. I started making some pictures. 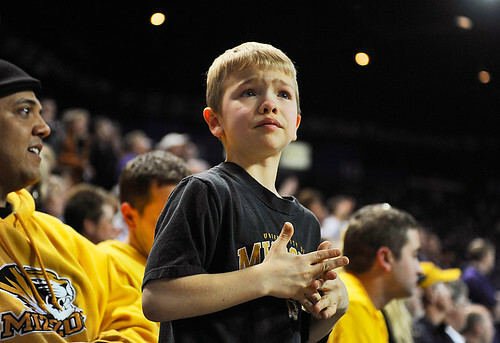 Ten-year-old Jack Kropf of St. Joseph, Mo., watches the Tigers lose to the Wildcats during the last 30 seconds of play at Kansas State. Yesterday while I was photographing the March March parade, two individuals in the parade stood out to me. The first was Carolyn, who is a professor-adjunct at the University of Missouri. 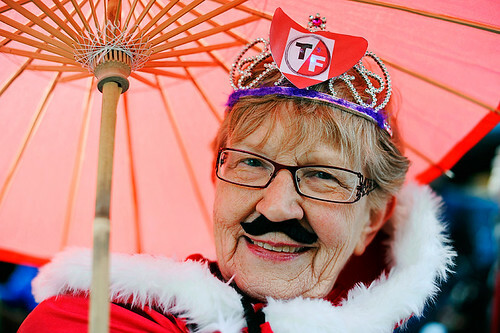 I’d spotted her while the marches were still parading (or, while the paraders were still marching? 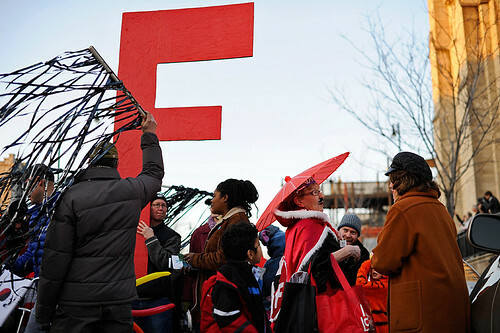 ), but found her again after everyone was gathered on Ninth Street. On Ninth Street between the Missouri Theatre and the Missouri United Methodist Church. Guess which one is Carolyn! Then she turned in the other direction. Now guess which one is Carolyn. And then I approached her and asked if I could take a portrait. She happily agreed. Carolyn, complete with a 'stache! I think it’s great that so many people came out with their own costumes and just had a great time marching around downtown Columbia. I’ll blog about the other individual who caught my attention… later. Today I’m traveling with two Columbia Missourian sports reporters and Jeff to Manhattan, Kan., where the men’s basketball team is playing tonight — so it’ll be a busy day! 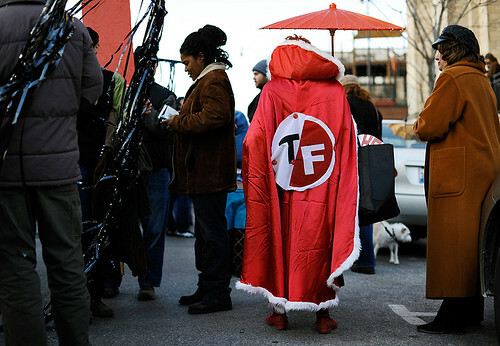 This evening, a few hundred bicyclists, unicyclists, hipsters, musicians and more marched through downtown Columbia to kick off the seventh annual True/False Film Fest. It was the March March parade. March March participants and onlookers gather in front of the parade's destination, the Missouri Theatre on Ninth Street. 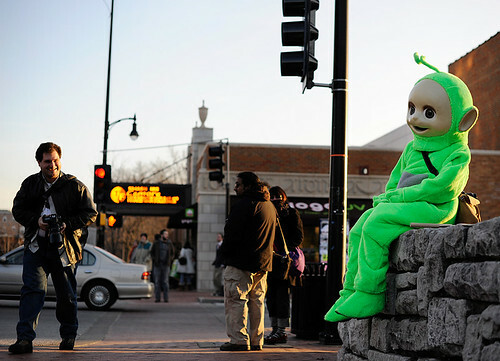 Erin and I were editing at The Columbia Missourian when we decided to take a break and make some pictures of the parade. Accompanied by David and every other photographer in town, we went downtown and, I’m confident, had a great, fun time. David (left) looks a little too happy to see a Teletubby at the corner of Locust and Ninth Streets. 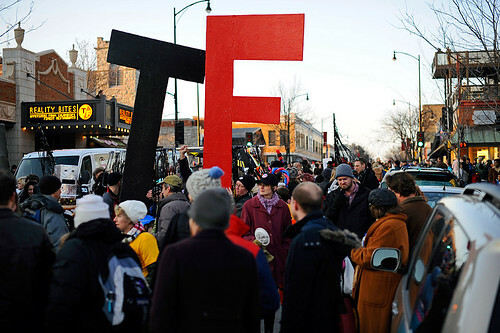 For those of you who may not know, True/False is a three-day documentary film festival that showcases dozens of pieces and that has steadily developed a reputation as a solid film event. The festival attracts visitors from all over the nation and the world, and it tends to bring out even the more reclusive residents of Columbia. I’m guessing his question had something to do with my three or four entries detailing the various meals Jeff and I have concocted over the past 20 or so days. Well, David, I’ve now got a response to your query. 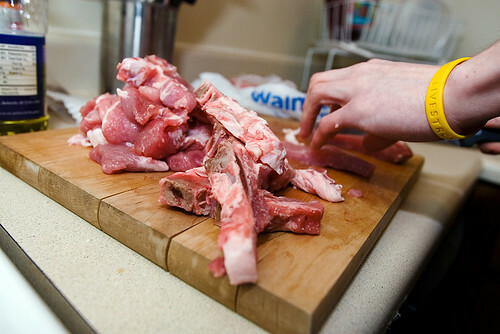 We haven’t had a chance to cook together since you asked Jeff — until tonight. 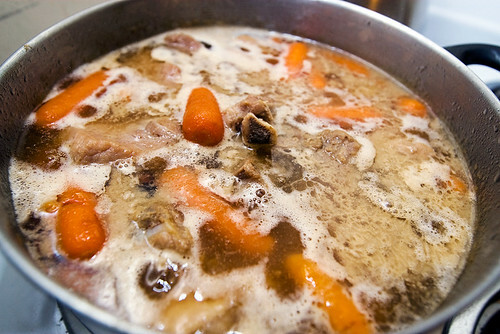 When we were at my house in Houston over winter break, my mother prepared pork stew with carrots and a brew of Chinese sauces and cooking wine. It is delicious, but I didn’t ask her for the recipe until we’d already returned to Columbia. So my mother e-mailed an approximate recipe and mailed up a few ingredients we wouldn’t be able to find in Columbia. So tonight, we attempted to replicate my mother’s success. Let’s just face it: This was going to happen. Today, I was still sick, so I missed classes and work and ventured outside only to attend the weekly sports beat meeting at The Columbia Missourian at 5 p.m. But apparently, being sick is no excuse for not taking a photo for the 30-day challenge (thanks, Erin), so when Jeff came over late tonight to return my camera that he borrowed… well, I didn’t mean to have him model for me. But that’s inevitably what happened. The set-up: We were sitting up, opposite each other, on my bed, and I had my legs drawn up with my sheets over my knees. 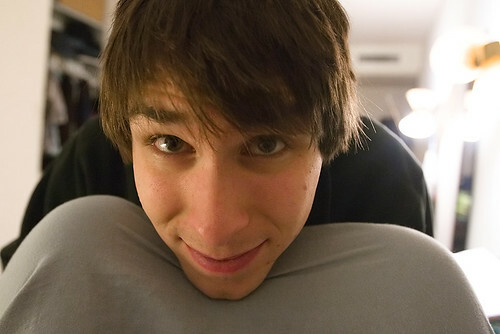 He was leaning forward with his chin nestled on the sheets between my knees — and I snapped a few photos. By no means are these the most journalistic images in this 30-day challenge. But like I said — this was just bound to happen. 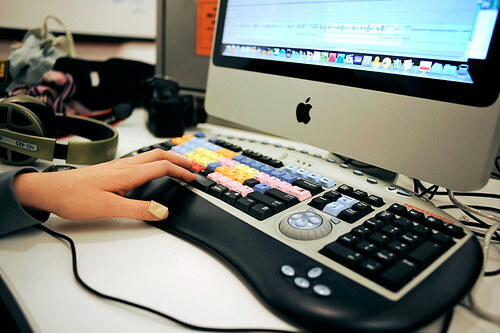 One of the projects in David’s capstone class is the one-day/five-points-of-view story. This is a picture story that must be told in five pictures and that happened over a relatively short period of time (no more than a few days). As you might have gathered from my blog, I chose to do a light exploration of backyard chickens in Columbia as a result of the recently-passed “chicken ordinance.” But now I’ll let the photos — and their captions — tell the story. The chickens have escaped from their greenhouse home on St. Joseph Road, and it's up to Adam Saunders to chase them back inside. 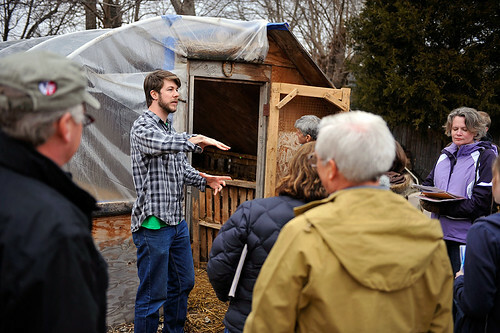 Saunders and other members of the non-profit Columbia Center for Urban Agriculture own six hens, which is the maximum number allowed by a Columbia city ordinance that permits urban residents to keep chickens in their backyard. 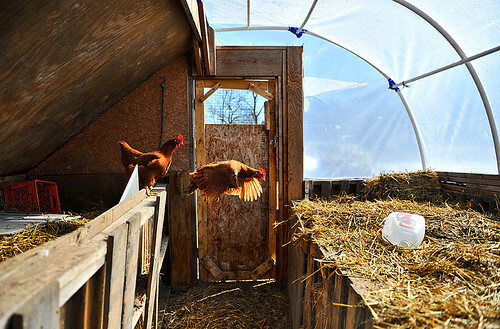 Five of CCUA's six hens stare each other down inside the greenhouse on Feb. 17. CCUA owns three Rhode Island Reds, one Buff Orpington, one Australorp-Rhode Island Red mix and one Dominic. Roosters are not allowed under the city ordinance, largely because of their crowing. Today, I have been sick and went to only one class. I’ve spent the rest of the day sleeping, consuming the healthiest foods I have in my meager pantry and watching the Olympics. 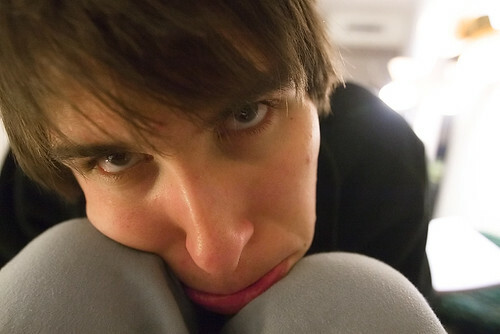 That is why I have no photo for today. Yesterday, I had classes, work and a group project nearly back-to-back-to-back. 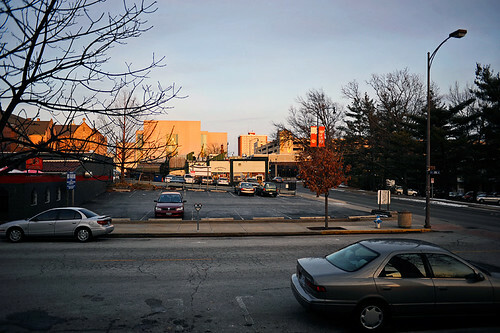 But when I left work at 5:45 p.m., I saw something unexpected: Daylight. I don't remember the last time I saw natural light while walking home from work. Then the group project. 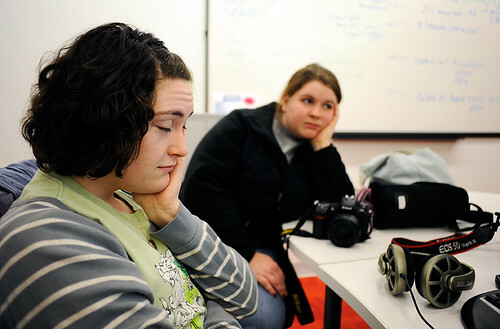 For our photo-editing class, Laura, Jessica and I were to edit a short video using raw clips provided by the Columbia Missourian director of photography. It was… an interesting exercise. The best part is, this was near the beginning of our working together on the group project. Fortunately, we know Final Cut reasonably well and completed work more quickly than we'd anticipated. Anyway. It’s been a long 48 hours, and I’m not quite feeling better yet. But I have good news: the data recovery company was able to recover all but about 1 percent of my data, and I’ll have everything back by Friday! 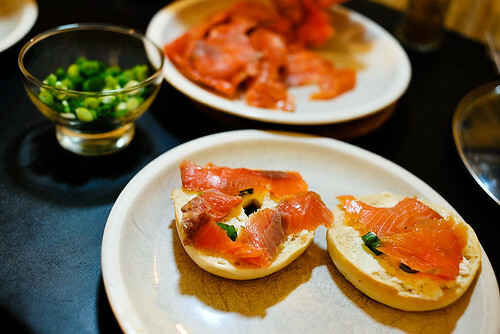 Smoked mid-Atlantic salmon on mini bagels with cream cheese and green onions. Although, it was about 1 p.m. today when Jeff and I each had three fully-loaded mini bagels. So really, the bliss that is bagels-and-lox is what any time of day was made for. That said, I wouldn’t recommend eating three fully-loaded mini bagels at any time of day: after consuming that much food all at once, I spent the next three or four hours sleeping very soundly. But that’s what Sundays were made for. This afternoon, I returned to the Columbia Center for Urban Agriculture‘s office/house to make more pictures for my one-day/five-points-of-view story. Adam talks about how CCUA is keeping its six hens in a greenhouse until the weather is warmer and the coop is built. The chickens were on the run! And they almost made it to the road. 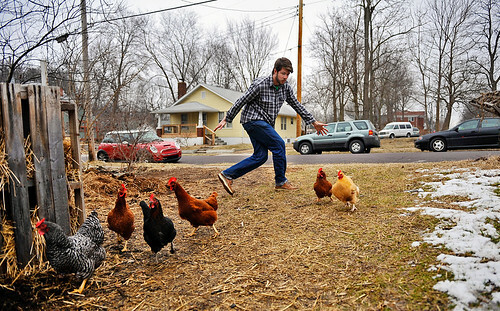 Adam herds the chickens away from the road and back toward the greenhouse. So why did the chickens (almost) cross the road? — Because they were tired of being cooped up! I’m really loving how I can milk all these old chicken jokes and references. And I think I’m good for my one-day/five-points-of-view story for capstone… I think. That's 10:15ish p.m., mind you. I spent my entire last weekend photo-editing for The Columbia Missourian — Friday night, all day Saturday and then Sunday morning at the rec center for the Missouri Grand Prix, and then Sunday afternoon and night in the newsroom for a regular shift. Then there was my regular shift on Tuesday afternoon. Which lasted until almost midnight. And now there’s today, which has turned into late tonight. All told, it’s about 47 hours of photo-editing, from last Friday afternoon through this Friday night. But now it’s time to go home, drink a Woodchuck and veg in front of the Olympic ice-dancing reruns. After Jeff and I ate at Grimaldi’s, we went to the waterfront off of Old Fulton Street to catch the fading light over the East River. 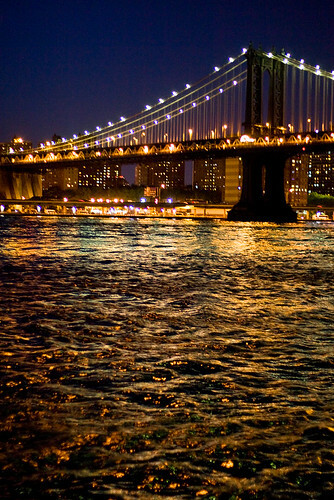 Manhattan and Brooklyn Bridge at night. Let me tell you: This was the first and only time I wished I’d had a tripod with me on the trip. We left the waterfront, wandered to the Brooklyn Heights Promenade, got a little lost in Brooklyn while looking for a bus stop and finally made it back to Manhattan via subway. 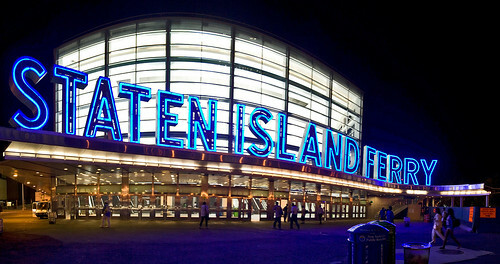 Then we took the midnight ride on the Staten Island Ferry. Panoramic composite of several images. Of course, we took the ferry right back to Manhattan, and then the M15 back up to my uncle’s apartment in the Lenox area of upper Manhattan. And that was the end of our first full day in New York City. Check out a few more photos I didn’t post here! Last September, my camera and I followed 11 agricultural journalism students into woods, prairies, caves and other pockets of southeastern Missouri. I emerged with plenty of photos from the trip, as well as a rash of chigger bites all over my ankles, waist area and, oddly, shoulders. Over the past five months, I’ve visited my general practitioner three times and a dermatologist four times. Four packs of prednisone and a number of other prescriptions later, the final diagnosis? The bites have been aggravated into dermatitis, and the only way they’re going away is if I stop scratching them. That’s the problem — they itch like nothing else. Yesterday, I began to apply a prescription of Cordran Tape. Self-portrait. Chigger bites on my right shoulder. The tape is medicated on the underside, and it prevents me from scratching and protects the bites from being irritated by my clothing. After five months of nothing working or helping except the prednisone — which is not a drug anyone should take often — this tape is a godsend. I’m really hoping these bites clear up before spring arrives and I should start retiring long sleeves and footed tights. After Jeff and I took never-before-taken photos of our walk on the Brooklyn Bridge, we went to Brooklyn Bridge Park, which is part of the DUMBO (“Down Under the Manhattan Bridge Overpass”) area. 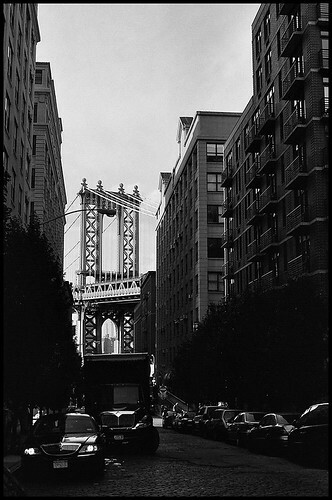 My version of an oft-taken photo of the Manhattan Bridge. We spent some time in Brooklyn Bridge Park, where we rested our feet near the East River and saw a photographer take photos of a wedding party. Then we left to get in line for a little pizza place called Grimaldi’s. 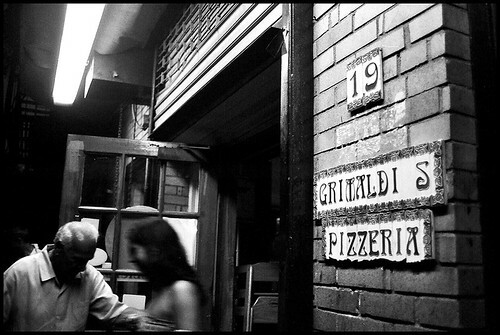 The Grimaldi’s proprietor holds the door for an exiting customer. This is probably my favorite of all the photos I took on this trip. Actually, it’s probably my favorite of all the photos I took last summer. I love the gritty graininess of the film, and the motion blur, and the tiled letters, and the brick, and the mood. We waited at least an hour in line outside the restaurant before we were seated inside the cramped pizzeria. New York City has its fair share of tourist traps with long waiting lines, but quite a few of the customers willing to brave the line were locals. And the pizza, which is baked in a coal-fired brick oven, was completely worth it. Check out a few more photos I didn’t post in this entry. Chickens are really funny animals. And they are, surprisingly, pretty fun to photograph. The way they strut around and interact with each other (there’s a reason why it’s called “pecking order”) is totally erratic and unpredictable. At least, that’s how it seemed to me — your everyday girl from suburbia — when I visited the chickens owned by the Columbia Center for Urban Agriculture. 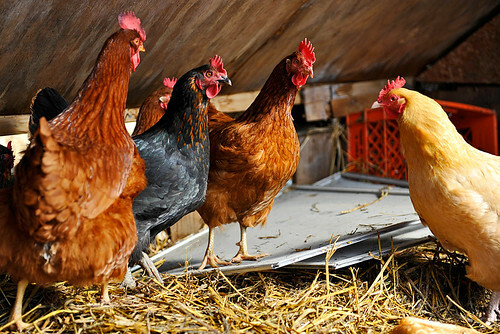 Columbia recently passed a city ordinance that allows residents to keep up to six hens in their backyards, with some restrictions on coops, waste management and etc. CCUA and its members currently keep six hens — three Rhode Island Reds, one Buff Orpington, one Australorp-Rhode Island Red mix and one Dominic — in a greenhouse across the street from its office/house, at least until they finish constructing the coop in the backyard. Jeff knows how to do things right. And so do I.
David and I serve our fellow photojournalism students by manning the department’s equipment locker, which houses more than $100,000 worth of photo, video and audio equipment (much of it is donated). It’s fun to help other students get acquainted with and appreciate quality gear, and it’s just as fun to tease those who are already gearheads when they come with a shopping list of exactly what they need to work on a project for a few days. It’s also a bit stressful at times. Especially Mondays. This semester, I’m the only one working on Mondays, which means I get to check in and reshelf all the gear that was checked out over the weekends. Today — as you can see by the photo — it got a bit out of hand. 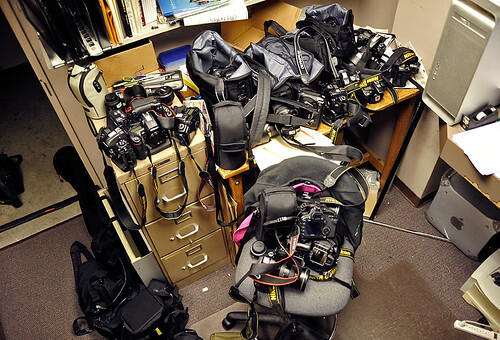 Students kept coming around to check in more gear or make reservations, so I didn’t get a chance to remove and charge batteries, detach lenses from cameras, replace back lens caps and camera body caps, or anything… until thirty minutes remained in my shift. The contents within my photo for today represents probably half of the photo inventory and a third of the entire locker’s invenory. By now, I would have blogged my Day 11 entry, and would be writing up my Day 12 entry, for the 30-day challenge. But because my portable hard drive crashed 15 minutes after I finished editing and submitting Missouri Grand Prix photos for The Columbia Missourian early this afternoon, those blog entries will have to wait. The photos for those entries — and for many, many other projects — are stored only on that hard drive, since it functioned as my scratch/working disk. If I can get those files recovered, I’ll blog Day 11 and Day 12. If not — oh, well. 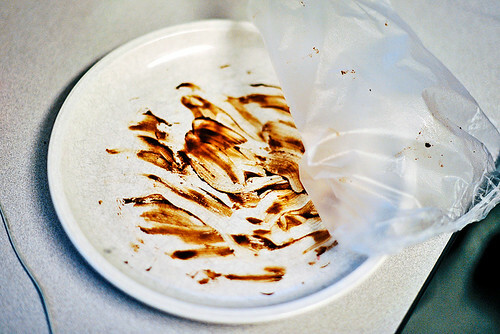 My chief concern is not that I might have lost two days of the 30-day challenge but rather that I regain the photos I’ve taken this semester and ensure that working files of several projects are still intact. None of the data I’ve lost has extremely personal information or constitutes a security concern — it’s just a lot of work that might be lost forever. Let this be a lesson to anyone and everyone who doesn’t back up data on a weekly basis. 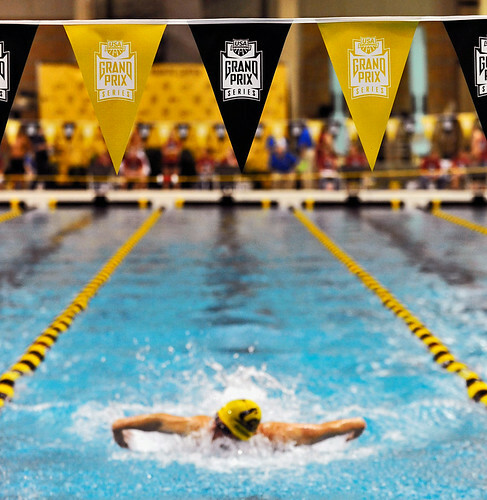 I’m spending this weekend at the Student Recreation Complex, where swimmers have gathered to compete in the fourth annual Missouri Grand Prix. The Columbia Missourian photographers are photographing. I’m there to edit — but between card dumps and transmissions to the photo desk, I have the opportunity to roam and make pictures, too. So that’s what I did tonight. I’ve shot dual-team meets at the rec center before, but never a full-blown, multi-day tournament whose roster includes Olympic swimmers. Tonight, I fiddled around a bit and tried not to resort to just the “one swimmer per frame” kind of shooting. Tomorrow and Sunday morning, because I know what to expect and where I can go, I’ll do better with this. That’s right. I volunteered to live-edit during almost my entire weekend. But I made a point not to volunteer for the Sunday evening shift — because I’m sure as hell not missing the pairs short program for the Winter Olympics. Summer in the city: Nobody’s EVER taken this photo before! 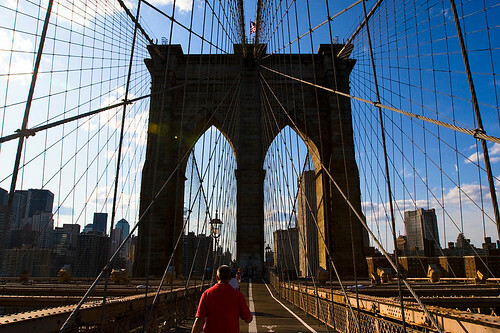 This was a particularly frequent utterance while we were walking the Brooklyn Bridge toward Brooklyn. We were being completely sarcastic. These photos have been taken before, by thousands if not millions of other people who have visited the same places we did. Check out some more photos I didn’t post in this entry. 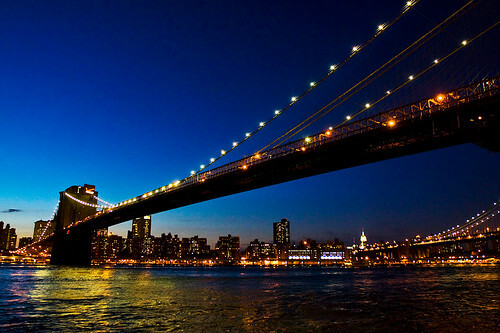 Coming up next: DUMBO… also known as, Down Under the Manhattan Bridge Overpass.